While the world was drooling (or seething) over the Mazda RX-Vision Concept’s Tokyo Motor Show debut, Subaru dropped something much more pedestrian. 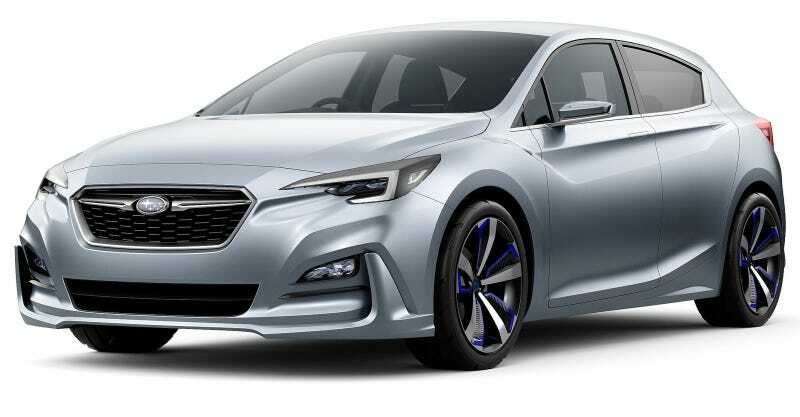 Behold the next Impreza, in concept form. It is slightly more interesting-looking than the current Impreza! No one really turns to Subaru for thrilling design, but this seemingly close to production look at their bread and butter hatchback isn’t bad at all. It’s clean and sharp with some nice lines, though it’s all a bit overdone. It should compete nicely with the Honda Civic among people who need to conquer snow every now and again. No word on specs yet, but expect all-wheel drive (duh) and some kind of boxer four-cylinder engine under the hood. I’d like to imagine that hood with a scoop on it, too. Say Subaru, where’s the WRX hatchback or wagon? Can you do that too?